Getting ready for a trip can be stressful, no doubt about it. Back when I didn’t travel that often, I would spend weeks preparing for my upcoming trips. I’d research tons of things about the destination, plan packing lists in my head (of course), and write down all the things I still needed to do to be as ready as possible. As my travels became more frequent, I got better at travelling and didn’t have to rely on checklists quite as much. However, that can be a double-edged sword. Sometimes, I get over-confident and leave everything to the last minute. 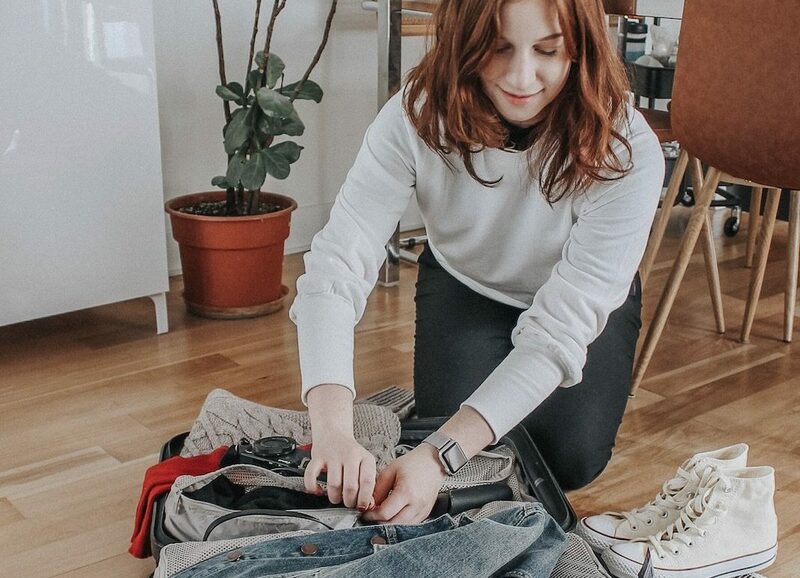 That’s why today, I’m sharing all my tips to make last-minute packing and prepping for your trip as stress-free as possible. Hopefully, you don’t have too many to do before your trip, but you should definitely prioritize trips to the bank, post office, and dry-cleaner pickups because those depend on business hours outside of your control. In the last 24 hours before a trip, prioritize errands that have to be done during business hours. If you have currency to exchange or a bill to pay before you travel, make sure you tackle that first so you don’t get stuck rushing and trying to beat the clock before the store closes. Make a list of these errands so you can be efficient about it. My packing starts with laundry because I can’t pack something dirty. If I’m packing last-minute, the worst thing is planning a packing list in my head only to discover that the pieces I planned to wear need to be washed and dried. Then it’s a huge rush to get that done and get them in my bag. If you have lots of laundry and think some of those things might be fun to pack, just go ahead and start a load. Even if you don’t use those clothes, it never hurts to have clean sheets and clothes to come home to. Choose a clean open spot where you can start planning your outfits and items. I’m visual, so it helps me to lay out my clothes and start assembling looks before they go in my suitcase. This could be done on the floor, your bed, or a table. Any clean flat surface works. Even if I have a written list or a list on phone, things inevitably change when I see them laid out. Even if you need these items up until the last minute, I usually start creating piles of things going in my suitcase in one central spot. This helps me when it’s time to actually fill up my suitcase because I’m not running around the house looking for things, they’re already all together. This also helps me not forget things. If you have a thought like “I should pack this”, act on it right away by moving that item into your trip pile. Mental notes are so easily forgotten. Much like the tip above, gathering your devices and charging them up is key to prepping for travel. Especially if you’re trying to get work done while on the move. I like to designate one charging spot near my suitcase where everything can be charging together. This also helps me not forget any cables and adapters. Click here for my techie traveller packing list. I make a mess when I’m running around my house preparing for a trip. Sometimes I’m baking snacks while I pack or I need to shower quickly, or I can’t be bothered to put away the clothes I decided not to pack. Nevertheless, I do try and tidy up before I leave because I love coming home to a clean house and fresh sheets. The payoff after a long trip home is always worth the extra effort. As I prepare plane snacks, sometimes I’ll cook and freeze something for my first meal off the plane. Too often I fly in after 10pm and I’m starving but don’t want fast food so my options are limited. In these cases, I like having a hearty meal ready to devour while I watch tv and run a bath. If you don’t really cook, you can prepare other things that help you relax after a flight. Check your flight details like the gate and terminal, plan your transportation when you land, and everything else you’ll need immediately and can affect your travel. Make sure you can access your boarding pass, check traffic to the airport and other details that can make you super anxious during a trip. Hope this helps you be less stressed out! Meal prepping – that’s such a good tip!